You apply codel to both lan and wan. That way it shapes traffic both directions. Even though logic says that if the packet has already made it to you, you should keep it. But if you drop it, that causes a resend which in turn causes the remote end to slow down the sending which then allows packets from other flows to traverse the queue faster. Admittedly, as the lan is typically faster than the wan, there should not be any slow down or drops. But I applied codel to both lan and wan. I turned codel off on the LAN side and notice no difference. I'm running an SG300-50P switch with 3 Engenius EAP1750 AP's for wireless clients, so admittedly a pretty fast LAN. I'm just going to leave it off for the LAN side - intuitively it makes more sense to me. I removed all my shapers and applied only codel. My downloads were as fast as I've ever seen them and simultaneous pings to my ISP's first hop were unaffected. 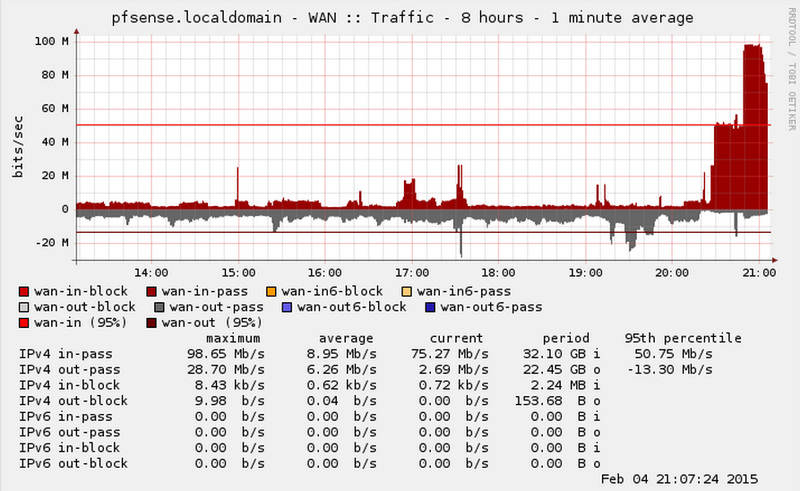 Uploads, however, resulted in ping latency going from about 12ms to about 175ms. HFSC completely cures that at the expense of a little top-end speed. I did leave the codel checkboxes checked on all my queues though. Strange since codel works on the sending interface. Hard to believe your bottleneck was LAN, but glad it's working for you. The heavy downloading (30 simultaneous newsgroup connections) lagged my home network web browsing likely because of the uplink ack packets it needed to send to sustain the speed. In any event, I've enabled codel on both my wan/lan and it has totally changed the experience. I don't doubt that it has helped, but I wonder by how much in actual numbers. If you could find an IP that returns table pings, get maybe 30 seconds of samples, then start downloading and get another 30 seconds of samples. Unfortunately, I cannot do any sort of tests on my network because my ISP has designed their network to have no buffer bloat and stable bandwidth. If I had my old ISP, I could have done such tests. While they were pretty good, they had classical issues of buffer bloat and bandwidth could briefly drop upwards of 30% during peak hours. Nothing horrible, but not "perfect". I recently watched an interview from one of the CoDel people showing a reduced number of pause frames when using CoDel, but unfortunately did not show his exact network setup or where CoDel was applied, so I made some assumptions that sound as if they are a bit incorrect. The difference between theory and practice, implementation details. Perhaps pause frames are sent some time prior to full buffer. Thanks for everyone helping to fix some of my false assumptions. There is obviously something more at play that I am missing. I love learning and I apologize for spreading somewhat false information. I use some stuff out of a youtube video. You run one process that pings 5 per second and outputs to a file. You run another that plots it with gnuplot. I wonder if my ISP uses fq_CoDel. This was taken during my recent issue with BitTorrent flooding my connection with up to 103Mb/s, yet my average was 98.6Mb/s as reported by RRD. Even then, my pings remained low. I cannot think of a way that my pings could remain so low while still maintaining large enough buffers to be practical. Packet loss indicates a full buffer, yet the pings do not reflect such a thing. fq_CoDel is the only algorithm that comes to mind. It was not this way prior to their recent upgrades. 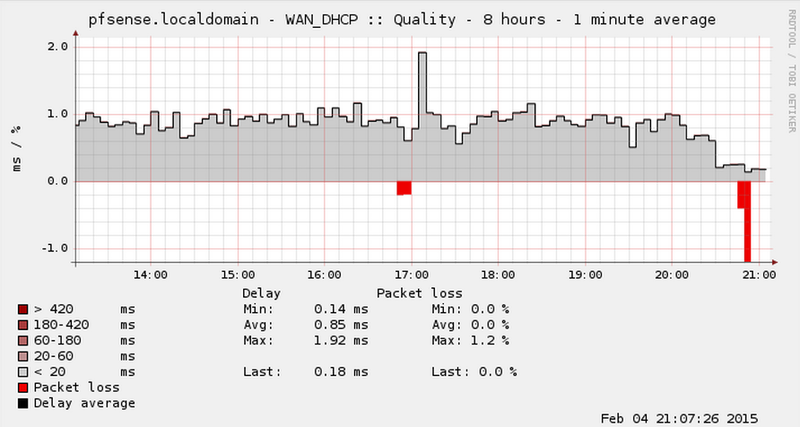 Packet loss was typically accompanied by latency, albeit 10-20ms. edit: Seems Cisco used the idea of CoDel and made PIE. Both are similar. Cisco even has fq_PIE. I assume this is why I see stable latency from my ISP. He's talking about it is of my opinion that CoDel won't be as effective if you don't set your interface bandwidth. It is logically impossible for CoDel or other forms of traffic shaping or queue management to work without having some means of knowing how quickly the queue should be drained. This is easy for a synchronous interface like plugging a 1Gb WAN into a 1Gb internet connection, but it is not so simple when you plug a 1Gb wan into a 30Mb internet connection. If your upstream does something like sending back pause frames, the WAN port can know to back off, allowing packets to buffer and CoDel to do its magic. Pause frames still mean that buffering is happening on the receiving interface, which is not desirable because you cannot control buffers in other systems. CoDel doesn't need to know the bandwidth because it's the interface's job to know how fast it's allowed to dequeue. CoDel just monitors the delays on the packets. Without something to limit CoDel, it will dequeue at full interface rate. I just wondered if inputing a number in the Bandwidth box would actually do anything because CoDel is knobless. It does do something. It does limit the connection. (I tested it by limiting my connection severely) The only reason I wondered if this knob/setting would work is because everything describes CoDel as knobless. But I also understood that it was an evolution of RED. RED having all the settings it did I could see that knobless in relation to CoDel ment, no settings but still takes a Bandwidth setting. This has, at least, turned into an interesting post with all these result studies. I may mirror some of the methods and post my results just to compare. I use the bandwidth settings to make sure that my upstream never ever receives data from me faster than it can process it. Even the CoDel people have stated in at least one of their many videos that it is desirable to make sure that your upload speed is slightly less than your actual rated speed. I have 100Mb, so I set it to 96Mb. If your immediate upstream buffer already uses CoDel or similar AQM, then you gain little or nothing, but most ISPs do not implement modern AQMs or any AQM. You want CoDel on the egress interface at any junction of a fast and slow interface pairing. Example, if you have a 10Gb interface that feeds into a 1Gb interface, you want the egress side of the 1Gb interface to have CoDel, as that is where the choke point is located. Another more common example would be a 1Gb uplink with 2 or more 1Gb feeds, then you want CoDel on the egress side of the 1Gb uplink. I just found this on their page. They have a whole section in tuning your rate limiter to work best with CoDel. They even warn against using hardware offloading because stuff like TSO can ignore your rate limiter, causing your interface to send data too quickly. Lastly, just running fq_codel by itself, does not help you very much when the next device in line is overbuffered (as in a home router next to today's cable modems). (it DOES help break up microbursts, however, and generally "does no harm") In that case, using HTB to rate limit your router to below the next gateway device and then applying fq_codel will work. See the note above about limitations to HTB. Just another cent that keeps me wondering….. Does this best-of-both-worlds "hybrid" setup actually works for more granular control?